After 4 years of looking at over 100 sites from Northern Spain to Yorkshire to Wales to South of France, Emily, Dan, Frank, NIna and Alexandra have finally landed at Wilderness Wood in Hadlow Down, East Sussex. 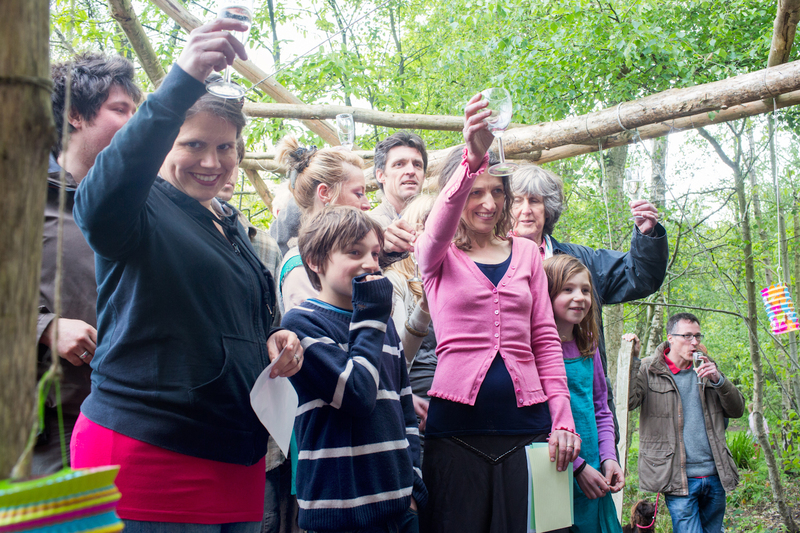 They completed on the purchase of the 62 acre woodland, house, cafe and workshop on the 22nd April and celebrated on the 10th May with the local village and people who have worked at the woodland over the years. They are looking forward to working with the materials and people to hand to create beautiful spaces to sleep, eat, work and learn. Watch this new space. This entry was posted in Uncategorized on May 19, 2014 by buildingforfamilies. 'The only education worth having is growing up into a worth-while world' Paul Goodman, anarchist writer.